The Stonehenge Alliance is astonished to find that a quarter of a century on from our earlier campaign against damage to the Stonehenge World Heritage Site we find ourselves once again opposing road-widening proposals that would severely damage this extraordinary landscape. We are now inviting people to sign our petition to stop the scheme. We are at an option development stage. That is, Highways England is considering options for widening the A303 by Stonehenge. It is a good time to look back over the intervening 25 years and read the Stonehenge Saga written by our founder members, the late Lord and Lady Kennet (Wayland and Elizabeth Young). The Kennets were some of the earliest campaigners to become embroiled in ambitions to improve the archaeological landscape. They termed this dispute with officialdom ‘a smouldering dispute’ and it is one that has characterised Stonehenge since 1991. Below is the Kennets’ lively account of the many proposals published in the Journal of Architectural Conservation (No. 3, November 2000, pp.70-85) entitled ‘Stonehenge: the Saga Continues’ . The history is instructive, at times like Alice Through The Looking Glass, the institutions and players are broadly the same as today, as are the campaigners’ sentiments. However the detail is different and the budget for a 2.9 km tunnel has grown dramatically. It can also be retrieved here from an archived website ironically headed ‘Earlier History’. This article is reproduced in full by kind permission of the authors’ family. Journal of Architectural Conservation, No 3 November 2000, pp.70-85. Parts of the Stonehenge World Heritage Site have been described as a ‘national disgrace”  This paper gives an account of the many proposals over the last decade to improve the state of the site and, at the same time, to provide for the dualling of the A303, an important road into southwest England. Although there was an informed consensus in 1995 that only a ‘long bored tunnel’ could provide a satisfactory outcome,  since 1997 the Government has claimed such a tunnel would be ‘unaffordable and uneconomic’ . It has declared in favour of twin tunnels, cut-and-covered, within a few tens of metres of the Henge, with their cuttings and portals at each end, extra ‘landscaping’, and some kilometres of new dual carriageway, all within the World Heritage Site landscape. Widespread and informed objection continues. A management plan has to be agreed with ICOMOS for this World Heritage Site (WHS). The existing visitor centre, with its grubby car park, tiny shop and loos, and the Stones fenced, is a ‘national disgrace’. The only undualled stretch of the A303, a main road to the south. west of England, runs right by the stones and across miles of ritual landscape and latent archaeology. Danger and delay have arisen. Further problems come from the large area of Ministry of Defence land to the north, and from Larkhill village, which does not want the traffic of several hundred thousand visitors passing through. Another road, the A344, important to local people and running even closer to the stones, would have to be closed. The only possible sites for the visitor centre are at Countess Roundabout, to the east, where a busy north-south road crosses the A303 and a flyover is the only answer. Another village, Winterbourne Stoke, has been promised a bypass, even though it has nothing to do with the Stonehenge problems, and this stretch of road is regularly included in the costs of the Stonehenge improvements. The main battlefront is between the Government (the Departments of Culture, Media and Sport (DCMS), and Environment, Transport and the Regions (DETR), and the Treasury) – not completely unready to fund A303 ‘improvement’, but for financial reasons backing a two-kilometre cut-and-cover tunnel on the line of the existing A303; and, facing them, a large swathe of informed people and organizations who back a longer bored tunnel, the better to preserve and restore the archaeology, the loneliness, the silence, and the mighty effect of the landscape. 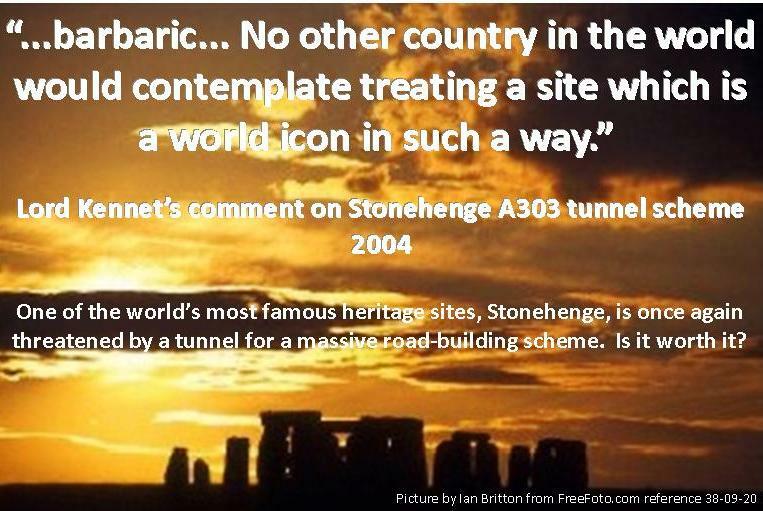 The cut-and-cover tunnel, they believe, would ruin precisely those qualities for which Stonehenge was nominated a World Heritage Site. The three requirements – management plan, visitor centre and better road – intertwine and interact. A factual chronology with minimum comment may show how. The British Government’s proposal that Stonehenge and its surrounding landscape and monuments become a World Heritage Site under the relevant international convention is accepted by UNESCO. 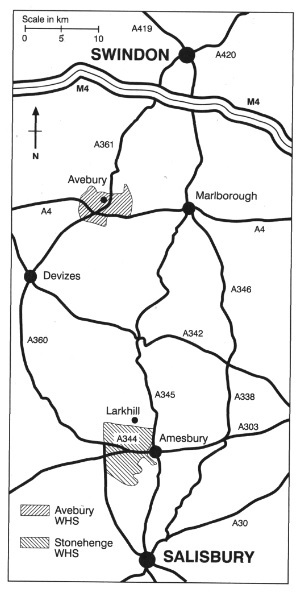 A dual site, ‘Stonehenge, Avebury and Associated Sites’ comprises Stonehenge and the complex of sites at Avebury, some 20 miles away (Figure 1). The ‘unparalleled landscape’ is mentioned as well as the neolithic monuments, and Her Majesty’s Government commits itself to their protection in this international context. English Heritage (which manages the stones, given to the nation in 1918) and the National Trust (which owns adjacent land bought by public subscription in the 1920s) jointly seek outline planning permission for a new visitor centre at Larkhill; it would have a new access road from the A344 through Fargo Plantation from the west. Salisbury District Council rejects the application because of its impact on landscape and archaeology (particularly the prehistoric cursus). An appeal is lodged, then withdrawn. An architectural competition for a visitor centre at Larkhill is won by Edward Cullinan, designer of the visitor centre at Fountains Abbey World Heritage Site – prize winning, but fiercely criticized in the on-site visitor book. A second, detailed, application is made for the Larkhill site, objected to, and withdrawn. A re-examination of eight possible sites begins. As possible routes for a dualled A303 at Stonehenge, the Highways Agency advances a northern route, a southern route and two on-line options, one with and one without a short cut-and-cover tunnel. After public consultation, all are rejected. The Public Accounts Committee of the House of Commons calls the ‘presentation’ of Stonehenge (i.e. the present car park and visitor centre) a ‘national disgrace’ . The first principle underlying all our joint discussions in recent years has been a total commitment, on the part of the Trust and English Heritage, to find a solution to restore, and to maintain thereafter, the unity of Stonehenge and its natural, unsullied setting. We have concluded that the only feasible on-line route [for the A303 which meets the essential requirements of this World Heritage Site is a long bored tunnel starting east of New King Barrows and finishing to the west well past the monument … that is the restoration to its grand and natural setting that is the National Trust’s and English Heritage’s duty. There is no historic site in England where we shall uphold that duty with greater resolve and determination. A ‘POST report’  on tunnelling is published by the Parliamentary Office of Science and Technology, proposing an improved system of cost-benefit analysis when archaeological, scientific, landscape and transport interests are in conflict, as at an imaginary site called ‘Twyburyhenge’ – a combination of Twyford Down, Newbury and Stonehenge – where an imaginary conflict had erupted between the Department of Transport and concerned citizens. The then Government spokesman, Baroness Trumpington, writes to Lord Kennet that World Heritage Site status is merely ‘honorific’. At the time, despite the Government’s commitment to the World Heritage Convention, the Department of Transport’s advisory documents on roads still stated that World Heritage Site status had no standing in planning law. A new Government is elected. The English Heritage and Tussauds Group application to the Millennium Fund under the Private Finance Initiative for a visitor centre at Countess East and related car-parking development is turned down. English Heritage mounts a conference on World Heritage Sites at which British practice in regard to World Heritage Sites is politely castigated by Dr von Droste, then Director of UNESCO’s World Heritage Centre. The Rt Hon Chris Smith, the Secretary of State for Culture, Media and Sport, announces that a management plan for Stonehenge is to be developed, as required by the United Kingdom’s commitments under the World Heritage Convention. (At this time, a major effort is being directed to the excellent management plan for Maritime Greenwich as a new United Kingdom World Heritage Site.) The Stonehenge Management Plan Working Party will not, however, start work until December 1998. A ministerial meeting (according to Halcrow 1998)  decides the long bored tunnel is ‘unaffordable and uneconomic’, and instructs English Heritage to produce new proposals. A full year before the Management Plan Working Party first meets, Chris Smith once again announces the visitor centre is to be at Larkhill, the Ministry of Defence having agreed to reconsider earlier objections. However, the same local and archaeological objections remain insuperable: the proposal is once again discarded. At some point, both Messrs Halcrows, for the Highways Agency, and the Centre for Social and Economic Research on the Global Environment (CSERGE), for English Heritage, are commissioned to produce reports. The first is an environmental assessment of four road options (including two earlier rejected, but excluding the English Heritage/National Trust and consensus-preferred LBT). CSERGE’s report is on the ‘heritage value’ of Stonehenge. Both report in 1998. Item 1: What does the policy or programme aim to achieve? Item 3: What impacts will the various options have on the environment at home and abroad? Consider both direct and indirect costs and benefits. Item 4: How significant are the impacts? Item 6: What method will be used to value the costs and benefits? Item 7: What is the preferred option and why? Item 8: What arrangements are in place for effective monitoring and evaluation? What data will be needed and when? Item 9: How will the appraisal be publicized? Coming from the DETR, this document, which addresses the problem of ‘non-monetarisable’ values, marks a significant change of priorities. The CSERGE Report  is completed. It gives Stonehenge a £300 million ‘heritage value’, apparently for Britons alone. Its value as a World Heritage Site or to ‘foreigners’ is not mentioned. The Report surfaces briefly, but is apparently shelved. Among its findings appeared to be a definite preference, among those it enquired of, for ‘no change’ rather than the cut-and-cover tunnel. This preference was not among the ‘options’, but can be deduced from the figures. Chris Smith’s Larkhill proposals are withdrawn and he proposes Fargo North for the visitor centre. Ten hectares of WHS land would be newly taken for the 3.5 km of new dualling of the A303 outside the cut-and-cover tunnels (but within the WHS). Eleven hectares in theory would be returned to grass, but there has to be a road of sorts for ‘non-A road traffic’ (horses, bicycles, and so forth) presumably on or near the existing line of the A303. There would be 400-500 metre approach cuttings at each end of the cut-and-cover tunnel or tunnels. The two or four portals would be large and disfiguring. Permanent lighting of the tunnels would be visible at either end day and night. There would still be noise and pollution. There would be a new, undisguisable, 200 x 150 metre hump of unstated height covering the tunnels in Stonehenge Bottom, in direct view of the stones. In dry weather, the two-kilometre tunnel scars could show. Only the landscape in the immediate ‘amphitheatre’ would be improved, not the landscape of the Stonehenge ‘bowl’, let alone that of the whole WHS. No estimate is provided for the costs of the several years of disruption during the proposed works. I would not wish English Heritage to press ahead with proposals for new visitor facilities – nor would they wish to – before all the relevant issues have been fully considered and satisfactory solutions have been found. It is essential that arrangements for visiting the site must be environmentally and archaeologically sustainable. An A303 Improvement Scheme is announced by the DETR as an ‘exceptional environmental scheme’. It includes a bypass for the village of Winterbourne Stoke, which Halcrow, and others earlier, had advised should be dealt with separately, not as part of the Stonehenge road plan. The scheme includes the on-line dualling scheme through the World Heritage Site that was rejected by consensus at the conferences in 1994 and 1995, two kilometres of it in cut-and-cover twin tunnels at the centre of the WHS (Figure 2). These intrusions can be ‘sensitively treated’ at the design stage. Chris Smith announces a Stonehenge Master Plan, even though the Stonehenge Management Plan Working Party has still not met. The Master Plan is endorsed by English Heritage and by National Trust officials. Public consultations are not known to have taken place, and the membership of the National Trust had not been informed, although National Trust land is involved. A DCMS official writes to David Part, Chairman of the Wiltshire Archaeology and Natural History Society: ‘The fact that the tunnel would result in the loss of five scheduled monuments is of course regrettable’. He appears unaware of the Halcrow list of permanent damage to the WHS (available from June 1998) and refers to ‘sensitive’ implementation. First meeting of the Stonehenge Management Plan Working Group, including representatives of local organizations, statutory bodies and landowners. Despite requests, including formal written ones, no critical discussion of the Master Plan is permitted in this group by Lady Gass, its English Heritage Chairman, while the Management Plan is being drawn up by the Working Party. Major issues are thus largely excluded from discussion because they are deemed to have been already dealt with by the Master Plan. This contradicts Lord Mclntosh’s parliamentary answer to a House of Lords question: . The Stonehenge World Heritage Management Plan provides the over- arching framework within which the Stonehenge Master Plan will be implemented. Highways Agency Consultation (mainly local) on the A303 improvement scheme, including the Winterbourne Stoke bypass. Unfortunately, the Consultation Document is so devised that indications of support for the bypass must simultaneously indicate support for the two-kilometre cut-and-cover tunnel. This Consultation has since been quoted as proving public support for the two-kilometre cut-and-cover tunnel. English Heritage, seeking an operator for the intended new visitor centre, advertises it as a ‘major international commercial opportunity’ in the property pages of the International Herald Tribune. The Management Plan Working Group had not yet reported, but it is claimed that bidders have been ‘informed’ of the Management Plan. In its agents’ (massive) documentation, English Heritage stated that the visitor centre ‘will be the Gateway to the Stonehenge World Heritage Site’: it was to be a ‘grand project of the highest prestige’ in the ‘tradition of the Propylaea to the Parthenon and the Queen’s House at Greenwich’. English Heritage also appears both to guarantee the operator’s commercial success, and to pledge itself to support the operator’s planning applications, and so forth, for the proposed 70-acre site at Countess East. These pledges were apparently later withdrawn. Lord Whitty, Minister for Roads, in a letter to Wayland Kennet, says that there will be an environmental assessment for the A303 Stonehenge scheme, as required by both European Union and national environmental legislation. It is announced that bids to operate the visitor centre have been received. There is no mention in the press release that the winning bid would have to be compatible with and governed by the Management Plan, which then was not even in draft. The English Heritage brief for Supplementary Planning Guidance by Salisbury District Council (SDC) outlines its plans for a major commercial development at Countess East as a visitor centre including, among other things, a ‘range of catering outlets including fast food restaurants and other beverage outlets’ and ‘a range of retail outlets’. Yet more ‘outlets’ would be ‘decided on [their] merits’. The brief for the SDC Planning Committee stated that the Master Plan, not the Management Plan, is the governing policy; this contradicts earlier announcements. Local residents form a group to express alarm at the traffic consequences; at the excessive scale of a commercial development outside the WHS (the Countess East site is larger than the Countess West site, within the WHS, which the residents would prefer); and at the uncertain economic and environmental viability of an explicitly commercial visitor centre. They notice that the visitor centre brief contains no safeguards on timing. If planning permission for a visitor centre were given before the roads are agreed, they would be faced with a fait accompli. The details of timing in the 13 October edition of English Heritage’s Master Plan Newsletter  are confusing. Confusion also remains over an implied suggestion that the operator would contribute to the ‘heritage’ cost of the new road schemes, roundabouts and flyovers. The operator also appears to be promised a monopoly of car parking throughout the whole Stonehenge area, which would presumably have to be enforced by the Wiltshire police. A ‘pledge’ is made to local residents in English Heritage’s Master Plan Newsletter (Autumn 1999) that the visitor centre at Countess East would not open before the road improvements (including a flyover at the Countess roundabout) were in place and the A344 beside Stonehenge was closed; this would only be when the Master Plan’s first cut-and-cover tunnel at Stonehenge Bottom was complete and in operation. Not an easy-to-work-out timescale. Nor was it clear what the chosen operator would do in the mean time with the present visitor centre and car park, which remain a ‘national disgrace’. The ‘Heart of neolithic Orkney’ is accepted by UNESCO as a new United Kingdom World Heritage Site. The final draft of the Management Plan is presented to Chris Smith. It is widely welcomed, because it recognizes, as the Master Plan did not, that ‘Stonehenge’ consists of the whole World Heritage Site. It is not simply a ‘core’ immediately round the henge situated in a less important ‘setting’ where dualling roads, altering the landscape and setting up permanently lit tunnel portals might, by ‘sensitive implementation’, somehow be converted from vandalism to the acceptable. During 1999, ‘Seahenge’ was dismantled without proper advance explanation, and to public alarm; a ‘Stonehenge’ at Miami was saved; and the Leaning Tower of Pisa was described by Professor Tarabella of Pisa University, as ‘an Italian Stonehenge.’ Throughout 1998 and 1999, AT&T used Stonehenge in massive photographic advertisements on the back of the worldwide International Herald Tribune and in airports. January A new poster using Stonehenge appeared all over London and in the British press advertising another high-tech communications firm. Six bodies, including leading archaeological and environmental organizations, write to The Times voicing their alarm and suggesting that Stonehenge be placed on UNESCO’s List of World Heritage in Danger. The Chairmen of English Heritage and the National Trust, responding to this letter, admit that the current proposals for a cut-and-cover tunnel represent a ‘compromise’, but do not say who or what with, nor why they have gone back on their earlier public commitments. Press stories claimed the visitor centre decision was imminent; silence continued. On 24 February, ICOMOS-UK – the British arm of ICOMOS, to which-the Government submitted its Stonehenge Management Plan for approval – issued a ‘position statement on Stonehenge’ . Finally, the Stonehenge World Heritage Site Management Plan was published  with none of the fanfare and celebration that had accompanied the many ill-fated announcements of earlier years. The document has many merits: chiefly that it is in no doubt that Stonehenge is the whole World Heritage Site and that this is the area to ‘the protection, conservation, presentation, and transmission to future generations’ of which we are internationally committed by the World Heritage Convention. So it looks to be solving the first of the Stonehenge problems and highlights the faults of the Master Plan, elements of which would indeed cause irretrievable damage. The second problem – the visitor centre – is put on ice. On 10 July, English Heritage’s new Chairman, Sir Neil Cossons, announced that the search for a commercial operator for the visitor centre had failed: several hundred thousand pounds were spent on lawyers and consultants. It has not, fortunately, been recognized as a ‘major international commercial opportunity’. Instead, English Heritage is to ‘explore’ opportunities for a more hands-on role in its ‘operation’, which will be put out for public consultation in 2002. There remain the roads. The Highways Agency announced, also on 10 July, that the Countess Roundabout Flyover was accepted and planned for, as part of the Master Plan’s £130 million A303 improvement – on-line two-kilometre cut-and-cover tunnels and all. But now the local authorities are showing interest in a new ‘Southern Route’, proposed by a local resident, Colonel Parker, who is experienced in traffic management. The always unreasonable hope that ICOMOS might ignore the road issue if it liked the rest of the Management Plan has been scotched by ICOMOS-UK’s position statement of 24 February: a re-examination of all the road options is now required, including the long bored tunnel. Now we have seen what sums the Government can find for a fleeting failure like the Greenwich Dome, the needs of Stonehenge can no longer be dismissed as ‘unaffordable and uneconomic’ . With the ICOMOS requirement that the long bored tunnel needs to be assessed on equal terms with the Highways Agency’s plans for cut-and-cover, the old consensus of the middle 1990s may soon re-emerge. With her husband, Wayland Kennet, Elizabeth Young wrote Old London Churches (Faber & Faber, 1956), which pioneered an appreciation of London’s baroque churches. Their London Churches was published by Grafton in 1986, and their prize-winning Northem Lazio: An Unknown Italy by John Murray in 1990. Most of her other writing has been on political subjects – maritime and security issues – though she published a volume of poems, Time Is As Time Does, in 1959. Wayland Kenner was an active member of the House of Lords until the recent legislation abolished the participation of hereditary peers. He was the Minister in charge of Heritage and Planning for four years under Harold Wilson, and was Parliamentary Vice President of the Local Authorities World Heritage Forum. He is an Honorary Fellow of the RIBA, and President of the Avebury Society – Avebury and Stonehenge share a single World Heritage Site. Living in the Marlborough Downs, thought to be the source of the Stonehenge sarsens, Elizabeth Young and Wayland Kennet have been active in supporting the development of satisfactory solutions to the problems of the world’s premier monument of the Neolithic. 1 Public Accounts Committee, Report to the House of Commons (April 1993). 2 Highways Agency, A303 Planning Conference (November 1995). 3 Ministerial meeting (November 1997), quoted in Halcrow, Report to the Highways Department June 1998). 4 Public Accounts Committee, op. cit. (1993). 5 Sir Angus Stirling, Director General of the National Trust, speaking at Stonehenge: The Great Debate conference organised by English Heritage (8 July 1994). 6 Department of the Environment/Department of National Heritage, Planning Policy Guidance: Planning and the Historic Environment, PPG 15, HMSO, London (1994). 7 The Guardian (31 January 1996). 8 POSTreport, Parliamentary Office of Science and Technology (January 1997). 9 European Association of Archaeologists, Code of Practice, Ravenna (1997). 10 Halcrow op. cit. (1998). 11 CSERGE (Centre for Social and Economic Research on the Global Environment), report for English Heritage (1998). 12 Department of the Environment, Transport and the Regions, Policy Appraisal and the Environment, London (1998). 13 CSERGE op. cit. (1998). 14 Halcrow op. cit. (1998). 15 Letter from Chris Smith to Wayland Kennet (C98/04816/10624, 24 July 1998). 16 House of Lords, HL 5404 (December 1998). 17 Letter from Lord Whitty to Wayland Kennet (W/10418/99, April 1999). 18 English Heritage, Stonehenge Master Plan Newsletter (13 October 1999). 19 Letter from Chris Smith to Wayland Kenner (3 November 1999). 20 The Times (6 December 1999). 21 ICOMOS UK, Position Statement on Stonehenge (24 February 1999). 22 English Heritage, Stonehenge World Heritage Site Master Plan (April 2000). 23 NCE Roads Review (22 June 2000).